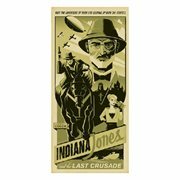 Is there an Indy fan in your midst? 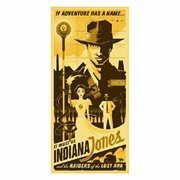 Wouldn't they just love to receive an action figure, giclee print, or other Indiana Jones collectible gift featuring their hero? Here's your chance. Go for it! Indy would. 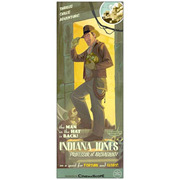 Is there an Indy fan in your midst? 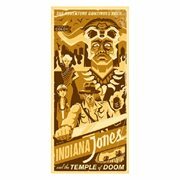 Wouldn't they just love to receive an action figure, giclee print, or other Indiana Jones collectible gift featuring their hero? Here's your chance. Go for it! Indy would. Dr. Henry "Indiana" Jones, Jr. (most famously known as “Indiana Jones” or “Indy,” and known as “Henri Defense” during World War I) is a fictional professor of archaeology, adventurer, and the main protagonist of the 1981 adventure film Raiders of the Lost Ark, its prequel Indiana Jones and the Temple of Doom, and sequels Indiana Jones and the Last Crusade and Indiana Jones and the Kingdom of the Crystal Skull. Jones is notable for his trademark bullwhip, fedora, leather jacket, and fear of snakes, and is most eminently played by Harrison Ford. In addition to his film and television appearances, Indiana Jones has been featured in novels, comics, video games, and other media. 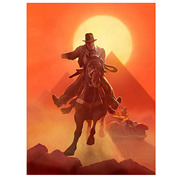 This article uses material from the Wikipedia article "Indiana Jones" and is licensed under the GNU Free Documentation License.